So much good stuff happened across television this year that we always create an extra special category to celebrate performers and shows in! We hope you enjoy our selections and root for your favorites by voting them into our #Top3 winners next week! Below, you'll find photo collages with the nominees and then the polls below the photos. You can vote multiple times and we encourage you to cheer on your favorites on social media with the hashtag #GoldenTrioAwards. Tweet, Tumble, and Facebook them into the spots they deserve! And be sure to check out the COMEDY/VARIETY and DRAMA nominees when you're done, too! 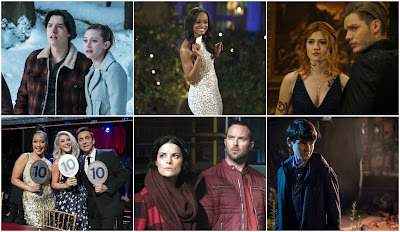 And don't forget to vote your favorites in the COMEDY/VARIETY and DRAMA nominees too! I will never believe that Fox couldn't make Pitch profitable. It was freakin' love letter and commercial for the MLB, which is a billion dollar business. The lack of advertising was practically criminal. The endorsements, product placements, overseas sales- it had big money written all over it.